When I reviewed Andy Siegel's "Suzy's Case" back in 2012 (my review: http://www.huntingtonnews.net/38057) I predicted trial lawyer/malpractice specialist Tug Wyler would return. 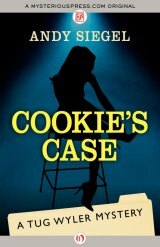 Tug is back -- in all his glory -- in "Cookie's Case" (MysteriousPress.com/Open Road, 281 pages, original paperback, $14.99). Tug returns with his idiosyncratic rhyming named wife Tyler Wyler and his quirky sons, Brooks and Connor and his daughter, Penelope, who can't decide on what they want people to call them. When he arrives at his office in a not-so-fancy stretch of New York City's Park Avenue from his home in upscale Westchester County he has to deal with his Puerto Rican paralegal Lily, who -- as I said in my previous review -- "accepts no lip from him." Cookie, his newest client, is the most popular performer at Jingles Dance Bonanza. When he's introduced to Cookie, who dances with a neck brace, Tug suspects there's a malpractice victim. She had spinal surgery and her doctor may have caused her problems. Her companion, Major, is a doctor who performs regular spinal taps on Cookie. Throughout the novel Tug Wyler is dogged by an young African-American man named Robert Killroy, who has a job as process server. Robert, who lives with his grandmother, is also a client who was injured when a van struck him. Robert is relentless in his attempt to serve Tug with papers from a dry cleaner who ruined one of Tug's suits. Andy Siegel's prose rings true and readers will quickly bond with Tug Wyler, who takes cases that are unusual and complex. If you long for the wit and humor of the late, great Donald E. Westlake (1933-2008), you should enjoy Andy Siegel's memorable Tug Wyler. "When a guy's been practicing law in New York City for over twenty years and is about to publish his first novel, you don't look at him and think, 'Hey, at Great Neck North High School on Long Island, they kept him in remedial reading through eleventh grade.' But it's true. There I was, meeting three times a week with about five other students in a classroom with a solid wooden door and a tiny window set up high to prevent nosy kids from sneaking a peek. The only problem was that, by junior year, everybody else was tall enough to look in. "Being seen there never bothered me, though. If one of my buddies tapped on the window to catch my attention, making a stupid face, I merely held up my bag of Doritos, sipped my ice-cold Coke and pointed to the TV remote I was holding. Then, before turning back to the screen, I'd flash him a big grin. "In fact, I should have been out of there sooner. But I was in no hurry to say good-bye to those deep, comfy chairs and fully stocked vending machines, the only ones in the building. As I sat there happily munching chips, it never once occurred to me I might one day publish a novel. What a crazy idea. "But all things turn out to be connected -- even if you don't always understand right away why or how they are. From that classroom came my earliest identification with the underdog. Okay, I had great deal more confidence than the rest of the kids sitting around me -- and none of their other problems -- but I'd been one of them. I knew what it felt like to be on the wrong side of the door. "Justice is something you shouldn't have to compete for . . . but it is. "After I graduated from law school [Brooklyn Law School, JD 1985 -- after earning his bachelor's degree from Tulane in 1985] and began practicing, I quickly realized it was the little guys of this world, the small fry, the ordinary joes who don't know how to stand up for themselves, who most engaged -- and needed -- my legal expertise and my fighting spirit. "So how did Tug Wyler come into being? He was undoubtedly hanging around, shadowing my daily life for a long time; I just didn't know it. But here's the short version: one morning, on the train into the city from Westchester--where I live with my wife, three kids, three dogs and an upstairs cat--the idea of him just appeared in my head. I don't know from where. But there he was. "Unable to shake the spell he cast, I began to write, each morning when I got on Metro North, what's now become 'Suzy's Case'. But I was doing it only to amuse myself. I sure didn't read courtroom mysteries or legal thrillers; as far as I was concerned, I was living them. 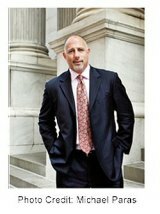 "It's common to diss malpractice and personal injury lawyers. Ambulance chasers, they call us. Me, I see it differently. As far as I'm concerned, we're the Robin Hoods of the profession, righting wrongs with every bit the same commitment he had to putting those culpable, most often the rich and powerful, in their place. "Anyone, in an instant, can become a victim. Even you. "The rush to cover up genuine wrongs of the sort that lie at the heart of 'Suzy's Case' -- and the other Tug Wyler adventures I intend to write -- happens continually out there in the real world. Believe me, fiction doesn't know the half of it. What keeps me going into my office without fail each morning is my compulsion to make the system work for the injured victim when the big insurance companies vigorously resist such an outcome. It isn't easy, but it's what I do, and I love it. "I should add, it's no secret I enjoy joking around and have what some might even call a warped sense of humor. But though my methods may appear like smart-aleck comedy to my adversary or to the fellow in the robe with the gavel, my frequently unconventional approach is critical to helping me stay sane, dealing as I do on a daily basis with one set of catastrophic circumstances after another. One thing is certain: no one opposing me is ever able to anticipate all the angles I might spring in the course of a legal brawl. "For Tug Wyler readers, I promise the same mix: a rule-bending high-tension conflict during the course of which you'll laugh in spite of yourself . . . while never knowing what's going to happen next. Like me, Tug's the kind of street-smart push-it-to-the-limit lawyer you'd want on your side when the worst has happened."